Normally, a good night's sleep can work wonders. Inside the disorienting premise of InSomnia , you've been asleep for 20 years on a semi-derelict station as it lumbers through space on a mysterious journey. As one of the few people not held in sleep stasis to preserve resources, it's up to you to survive among the ruins of the station and figure out what's been going on while you were unconscious. InSomnia is being developed by the Russian studio MONO, which is calling the new project "a mixed-genre game" on its website . "It combines elements from strategy, tactical, and real-time action games," says the developer. "The camera angle is reminiscent of classic RPGs. Its basic approach to narrative and character development via a massive variety of statistics, items, and actions also owes much to RPGs." 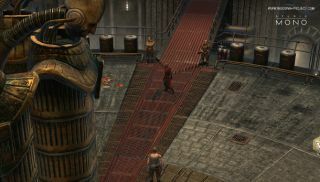 The real-time elements should include both PVP and PVE scenarios, with some battles including as many as 58 players "in a single location," according to the developer . The game won't be asking you to commit to a specific class, but instead expects players to develop stats and skills that fit their particular approach to dealing with life on the "Dump," as the mostly-deserted space station is known. You can check out some alpha test footage in the video below as well as get a taste for the soundtrack here . The camera angle and setting hint at games we've seen before, but with a premise and story that feels new, especially if the idea of a wasteland starship is pushed to its logical extremes. InSomnia currently lacks a release date, but beta testing may be starting "shortly," according to MONO.